Finding a day when you are remotely aware of the hustle and bustle of activities around you is quite difficult these days. I was lucky to find one when I found myself drifting to the days gone by. I clearly remember the decision to move away from the family-run business. It meant proving my own footing in whatever I pursued. Employment with DOT Alcatel Research Center and HCL America as a network consultant, prior to starting my own company, provided just the right platform and helped me create my own identity. While working as a network consultant in the US, I sensed a lot of potential in internet, which was fast taking over business space. Already churning the wheels of developed countries in motion, internet was emerging as a necessity in the business world. India was also getting a taste of this technology, and this gave me the idea of testing the shores of entrepreneurship. I realized mixing internet technology with the large base of MSMEs, who were biggest contributors of growth in India, could possibly turn the tides in their favor and help them draw huge benefits from it. Exposing them to the online medium could propel them to the next level of growth and in turn also benefit the Indian economy. 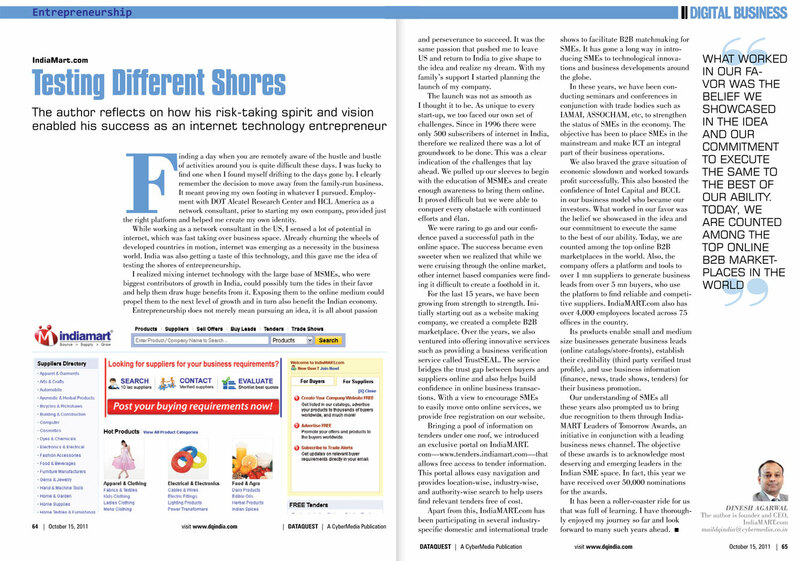 Entrepreneurship does not merely mean pursuing an idea, it is all about passion and perseverance to succeed. It was the same passion that pushed me to leave US and return to India to give shape to the idea and realize my dream. With my family’s support I started planning the launch of my company. The launch was not as smooth as I thought it to be. As unique to every start-up, we too faced our own set of challenges. Since in 1996 there were only 500 subscribers of internet in India, therefore we realized there was a lot of groundwork to be done. This was a clear indication of the challenges that lay ahead. We pulled up our sleeves to begin with the education of MSMEs and create enough awareness to bring them online. It proved difficult but we were able to conquer every obstacle with continued efforts and élan. We were raring to go and our confidence paved a successful path in the online space. The success became even sweeter when we realized that while we were cruising through the online market, other internet based companies were finding it difficult to create a foothold in it. For the last 15 years, we have been growing from strength to strength. Initially starting out as a website making company, we created a complete B2B marketplace. Over the years, we also ventured into offering innovative services such as providing a business verification service called TrustSEAL. The service bridges the trust gap between buyers and suppliers online and also helps build confidence in online business transactions. With a view to encourage SMEs to easily move onto online services, we provide free registration on our website. Bringing a pool of information on tenders under one roof, we introduced an exclusive portal on IndiaMART. 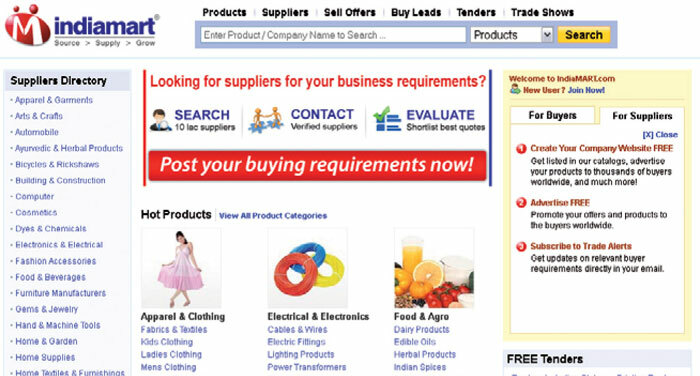 com—tenders.indiamart.com—that allows free access to tender information. This portal allows easy navigation and provides location-wise, industry-wise, and authority-wise search to help users find relevant tenders free of cost. Apart from this, IndiaMART.com has been participating in several industryspecific domestic and international trade shows to facilitate B2B matchmaking for SMEs. It has gone a long way in introducing SMEs to technological innovations and business developments around the globe. In these years, we have been conducting seminars and conferences in conjunction with trade bodies such as IAMAI, ASSOCHAM, etc, to strengthen the status of SMEs in the economy. The objective has been to place SMEs in the mainstream and make ICT an integral part of their business operations. We also braved the grave situation of economic slowdown and worked towards profit successfully. This also boosted the confidence of Intel Capital and BCCL in our business model who became our investors. What worked in our favor was the belief we showcased in the idea and our commitment to execute the same to the best of our ability. Today, we are counted among the top online B2B marketplaces in the world. Also, the company offers a platform and tools to over 1 mn suppliers to generate business leads from over 5 mn buyers, who use the platform to find reliable and competitive suppliers. IndiaMART.com also has over 4,000 employees located across 75 offices in the country. Its products enable small and medium size businesses generate business leads (online catalogs/store-fronts), establish their credibility (third party verified trust profile), and use business information (finance, news, trade shows, tenders) for their business promotion. Our understanding of SMEs all these years also prompted us to bring due recognition to them through IndiaMART Leaders of Tomorrow Awards, an initiative in conjunction with a leading business news channel. The objective of these awards is to acknowledge most deserving and emerging leaders in the Indian SME space. In fact, this year we have received over 50,000 nominations for the awards. It has been a roller-coaster ride for us that was full of learning. I have thoroughly enjoyed my journey so far and look forward to many such years ahead.